Evanston/Skokie District 65 school board member Sunith Kartha talks about district food policy. Parents and district officials met Thursday to discuss a proposed rule that would require all food served at school events to be commercially prepared. District 65 parents voiced heated opposition Thursday night to a proposed district policy that would require all food served at school events to be commercially prepared. The Evanston/Skokie School District 65 school board and parents have been working to craft safety guidelines for food and beverages available on school campuses after receiving a request last March from the Evanston Health Department to develop a more concrete policy on how to safely harvest and serve produce from school gardens. Based on existing food regulations from the Illinois Department of Public Health, the proposed policy would ban schools from serving locally prepared foods at school or school-sponsored events. 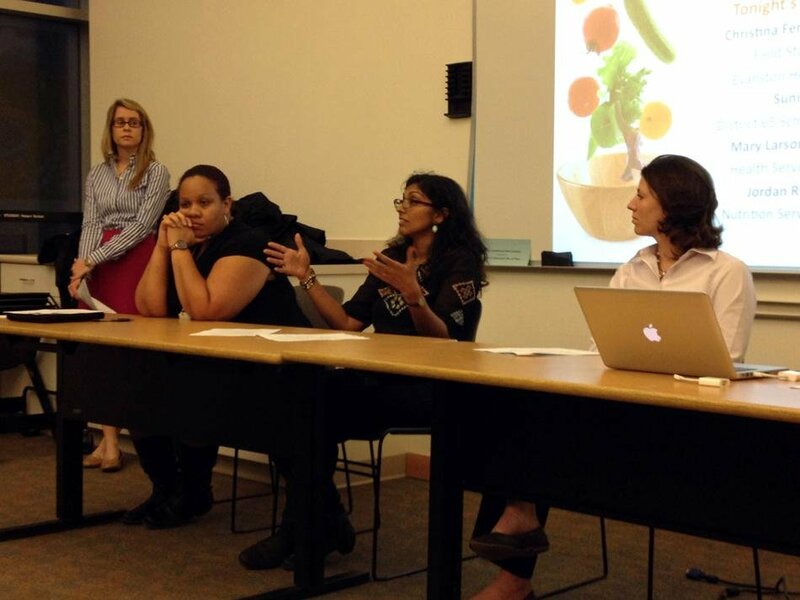 While conducting research on IDPH food policies, the district also discovered and interpreted a state law to mean that potlucks are banned statewide in all public places, said district school board member Sunith Kartha at a meeting held Thursday night by the District 65 Wellness Team. At the meeting, parents expressed strong disapproval for the draft policy, which many claimed will lower the nutritional quality and cultural variety of food served at schools. Under the proposed provision, parents cannot cut up fresh produce and bring it to school events or give it to teachers to serve in class. To do so, parents must deliver fruit and vegetables “whole and intact” one day in advance to the district’s Nutritional Services, where food service workers can wash and cut produce for events at no cost. Conversely, parents can also pay the district for yearly catering programs that provide nutritious snack options for kids in school. Parents, however, complained these procedures are too time-consuming and costly for low-income families. Others questioned the validity of the district’s interpretation of the IDPH’s food regulations. Alicia Aiken, a lawyer and parent of children at Oakton Elementary and Chute Middle schools, said she read the section of the state law regarding potlucks to mean that cities cannot regulate potluck events, not that such gatherings are banned altogether. The meeting concluded with a spoken agreement between district representatives and parents to form an unofficial “task force” to revise the policy to cater to all food concerns from safety to nutrition to community ties. Kartha said the next step will be to reach out to the parents who volunteered to help in the drafting process and to continue the discussion. She said the policy likely will not immediately move forward, as the school board still intends to gather more research and public input.